Beamsplitters use two cube prisms with semi-reflective coatings to direct a portion of the light entering the beamsplitter to the accessory/camera port. The remaining portion of the light passing through the prism goes to the eyepieces. In the table below, the higher number is the percent of light going to the eyepieces. The camera adapter is a simple transmission device between the beamsplitter and the camera to be used. 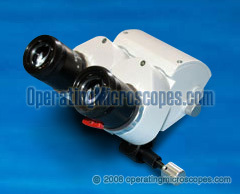 There are four different camera adapters for use with the Revelation physician microscope. Bright, white, daylight temperature (5500 degree K) illumination for critical viewing and photography. An excellent choice especially for digital cameras. 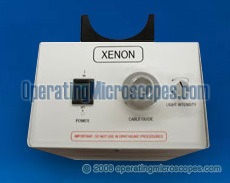 XENON180 The source is a 180w short arc xenon lamp with hot on/off capability. 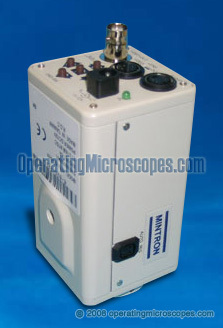 The unit has a mechanical brightness controller, a usage counter and is available for use with 110 or 220 line voltages. An adjustable coupler between the beam splitter and a binocular head that allows the assistant to view the same exact field as the physician with the same optical resolution. MC-A130S One of our binocular heads is necessary to complete the assistant’s binocular viewing option. High eyepoint eyepieces with adjustable eyeguards and lockable diopter settings. 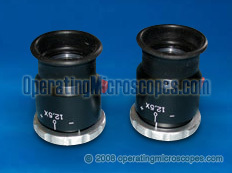 The following catalog numbers are for one eyepiece. 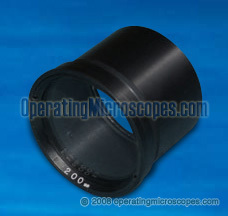 The objective lens is the primary component of image formation in the microscope. 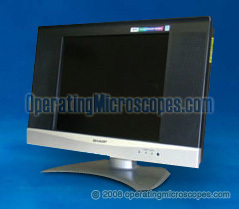 The intermediary lenses in the optics body and the eyepieces make this primary image larger or smaller as desired. The focal length of the objective lens determines its distance from the specimen. For example, an objective with a 250mm focal length will position the lens (or bottom of the optics body) approximately 250mm (10 inches) from the patient’s mouth.